Life can be scary for endangered loggerhead sea turtles immediately after they hatch. After climbing out of their underground nest, the baby turtles must quickly traverse a variety of terrains for several hundred feet to reach the ocean. While these turtles' limbs are adapted for a life at sea, their flippers enable excellent mobility over dune grass, rigid obstacles and sand of varying compaction and moisture content. A new field study conducted by researchers at the Georgia Institute of Technology is the first to show how these hatchlings use their limbs to move quickly on loose sand and hard ground to reach the ocean. This research may help engineers build robots that can travel across complex environments. "Locomotion on sand is challenging because sand surfaces can flow during limb interaction and slipping can result, causing both instability and decreased locomotor performance, but these turtles are able to adapt," said Daniel Goldman, an assistant professor in the Georgia Tech School of Physics. "On hard-packed sand at the water's edge, these turtles push forward by digging a claw on their flipper into the ground so that they don't slip, and on loose sand they advance by pushing off against a solid region of sand that forms behind their flippers." Details of the study were published online on February 10, 2010 in the journal Biology Letters. This research was supported by the Burroughs Wellcome Fund, National Science Foundation, and the Army Research Laboratory. In collaboration with the Georgia Sea Turtle Center, biology graduate student Nicole Mazouchova studied the movement of sea turtle hatchlings of the species Caretta caretta at Jekyll Island on the coast of Georgia. She and research technician Andrei Savu worked from a mobile laboratory that contained a nearly three-foot-long trackway filled with dry Jekyll Island sand. The trackway contained tiny holes in the bottom through which air could be blown. The air pulses elevated the granules and caused them to settle into a loosely packed solid state, allowing the researchers to closely control the density of the sand. In addition to challenging hatchlings to traverse loosely packed sand in the trackway, the researchers also studied the turtles' movement on hard surfaces -- a sandpaper-covered board placed on top of the sand. Two high-speed cameras recorded the movements of the hatchlings along the trackway, and showed how the turtles altered their locomotion to move on different surfaces. "We assumed that the turtles would perform best on rigid ground because it would not give way under their flippers, but our experiments showed that while the turtles' average speed on sand was reduced by 28 percent relative to hard ground, their maximal speeds were the same for both surfaces," noted Goldman. The researchers' investigations showed that on the rigid sandpaper surface, the turtles anchored a claw located on their wrists into the sandpaper and propelled themselves forward. During the thrusting process, one of the turtle's shoulders rotated toward its body and its wrist did not bend, keeping the limb fully extended. In contrast, on loosely packed sand, pressure from the thin edge of one of the turtle's flippers caused the limb to penetrate into the sand. The turtle's shoulder then rotated as the flipper penetrated until the flipper was perpendicular to the surface and the turtle's body lifted from the surface. "The turtles dug into the loosely packed sand, lifted their bellies off the ground, lurched forward, stopped, and did it again," explained Goldman. To extend their biological observations, Goldman and physics graduate student Nick Gravish designed an artificial flipper system in the laboratory. The flipper consisted of a thin aluminum plate that was inserted into and dragged along the trackway filled with Jekyll Island sand. Calibrated strain gauges mounted on the flipper provided force measurements during the dragging procedure. "Our model revealed that a major challenge for rapid locomotion of hatchling sea turtles on sand is the balance between high speed, which requires large inertial forces, and the potential for failure through fluidization of the sand," explained Goldman. "We believe that the turtles modulate the amount of force they use to push into the sand so that it remains below the force required for the ground to break apart and become fluidlike." Goldman and his team plan to conduct further field studies and laboratory experiments to determine if and how the turtles control their limb movements on granular media to avoid sand fluidization. 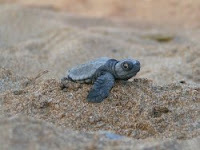 They are also developing robots that move along granular media like the sea turtle hatchings. "These research results are valuable for roboticists who want to know the minimum number of appendage features necessary to move effectively on land and whether they can just design a robot with a flat mitt and a claw like these turtles have," noted Goldman.